The above copper farthing measures 16.2 mm and weighs 0.76 grams. It was issued in the name of the Palsgrave’s Head tavern in the district of Temple Bar Without, Westminster. Obverse: (star) THE.PAVLSGRAVE.HEAD , around twisted wire inner circle, depiction of the Palsgrave (i.e. the Elector Palatine of the Rhine) within. Reverse: (star) WTHHOVT.TEMPLE.BARR , around twisted wire inner circle, triad comprising I | .R. | (rosette) D , within. 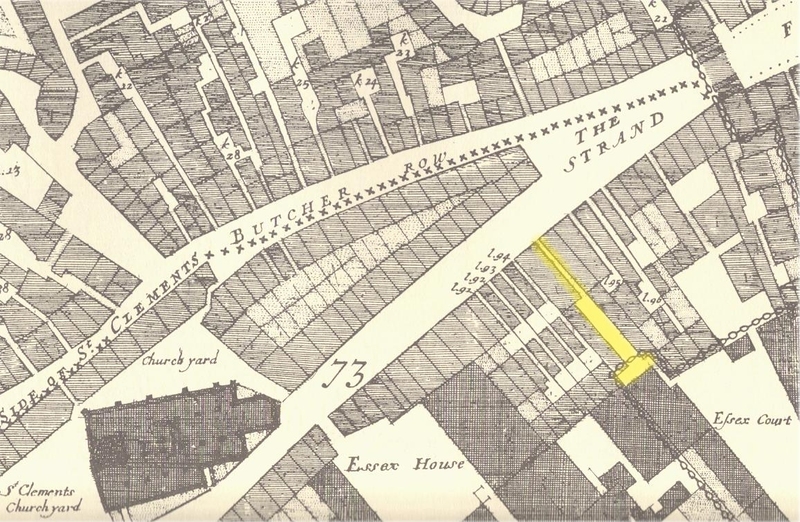 The Palsgraves Head tavern was situated in Palsgrave Place, a narrow paved court which ran off the south side of The Strand, about half way between Temple Bar and the St. Clement Danes Church. The court and tavern took its name from the sign of the Palsgrave’s Head. The title of “Palsgrave” was an alternative to that of Count or Elector Palatine of the Rhine (a former territory of the Holy Roman Empire). The Palgrave in question has traditionally been associated with Frederick V (1596 to 1632) who held the tile of Elector Palatine between 1610 to 1623 and briefly that of King of Bohemia between 1619 and 1620. In 1612 Frederick married the Princess Elizabeth, the daughter of James I. A more recent alternative identification of the Palsgrave in question has been suggested as Charles Louis (1617 to 1680), the son of Frederick and Elizabeth and elder brother to Prince Rupert of the Rhine, the celebrated Royalist General of the English Civil War. After the death of his older brother in 1629, and of his father in 1632, Charles Louis became Palsgrave, inheriting his father’s possessions in the Electorate of the Palatinate. Along with his younger brother Prince Rupert of the Rhine, he spent much of the 1630s at the court of his uncle, King Charles I, in England, hoping to enlist English support for his cause. The young Elector Palatine was largely unsuccessful in this, and became gradually estranged from the King, who feared that Charles Louis might become a focus for opposition forces in England. Indeed, the political crisis leading up to the outbreak of the English Civil War, Charles Louis had considerable sympathy for the parliamentary leaders, especially the Earl of Essex, feeling them more likely to come to the aid of the Palatinate on the continent. Although Charles Louis was involved in the early stages of the Civil War with his uncle, he was mistrusted for his parliamentary sympathies, and soon returned to his mother in The Hague. There he distanced himself from the royalist cause in the Civil War. In 1644, Charles Louis returned to England at the invitation of Parliament. He took up residence in the Palace of Whitehall, even though his brothers, Rupert and Maurice, were Royalist generals. Contemporaries (including King Charles) and subsequent generations believed that Charles Louis’ motive in visiting Roundhead London was that he hoped that Parliament would crown him King, in place of his uncle. 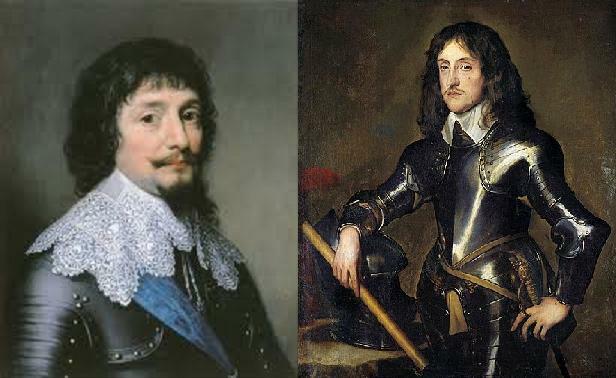 Charles Louis’ endorsement of the Parliamentary party was a cause of enmity between uncle and nephew, and when a captive Charles I met his nephew once again in 1647, the elder Charles accused the Prince of angling after the English throne. Charles Louis was still in England in October 1648 when the Peace of Westphalia restored the Lower Palatinate to him. He remained in England long enough to see the execution of his uncle Charles I in January 1649. He returned to the Rhine Land the same year never to return to England. His English relations and mother never forgave him for his Parliamentary alliances during the Civil War. If a reference to Palsgrave Place or Court could be found prior to the death of Frederick V in 1632 the true identity of the particular Palsgrave refered to in the 17th century sign board could be confirmed. Contemporary portraits of Frederick and Charles Louis do note rule out either man as that featured in the original sign and reproduced on the above token. However, on balance the portrait of the latter does appear to most resemble that depicted on the token. The farthing token looks typical of the style of others which can be dated to the 1650s. 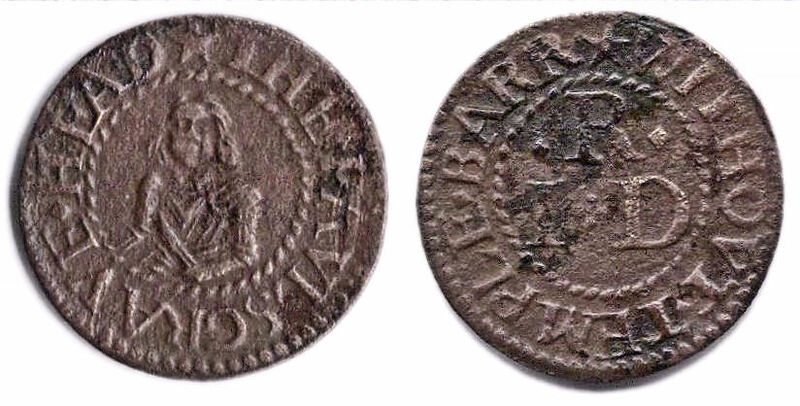 A further half penny token exists m this tavern which appears slightly later in dated (c. late 1650s to mid 1660s). It is possible that the above half penny token was issued by the widow of the landlord (Mr. I. R.) who issued the original farthing token after she had re-married as both women have the same Christian name initial (i.e. “D”).